Click here for a closeup of this picture. 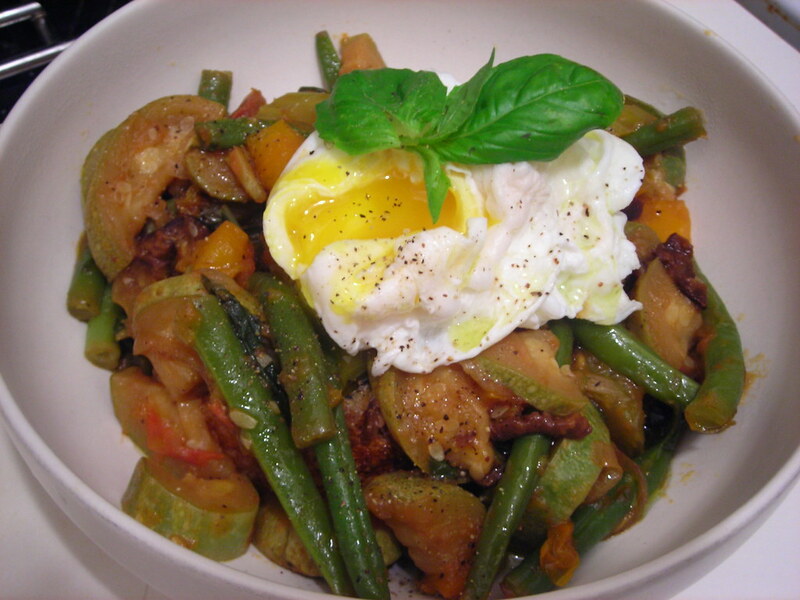 Stufato di verdure is a northern Italian vegetable stew common to Tuscany. This version was served with a poached farm egg and garlic-rubbed sourdough toast. The word stufata is a cooking technique similar to a braise, in which the ingredients are cooked in little or no water. The juices from the vegetables themselves form the stew’s gravy. Stufato should be served immediately lest the vegetables absorb what little liquid there is. Then it becomes more like ciambotta, a southern Italian dish that’s related to both ratatouille and caponata. Stufato is a year-round dish that’s limited only by your imagination and availability of ingredients at your local market. In autumn, it can feature pumpkin, squash, tomatoes, cranberry beans, cauliflower and peppers. In the winter, it might contain black cabbage, potatoes, carrots, chard and kale. In the spring, fava beans, baby artichokes, baby leeks, young peas, green garlic and turnips. You can make stufato several hours ahead and reheat, or serve it at room temperature. This goes well with a crisp white wine such as a pinot gris or Tokay d’Alsace. 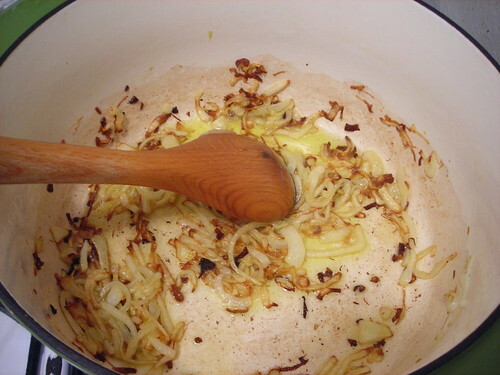 Pour 4 to 5 tablespoons olive oil into a large sauté pan or Dutch oven. Set over high heat. Sauté the onion until golden brown, about 10 minutes. Add the zucchini, celery and beans. Lower the heat to medium, and sauté until the zucchini is golden brown, about 10 to 15 minutes. Stir in the herbs, olives, sweet pepper, garlic and tomatoes. If using canned tomatoes, crush them with your hands as you go. Check seasoning. Reduce the heat to medium-low, cover, and cook 25 to 30 minutes, or until the vegetables are tender and their texture becomes silken. Adjust the heat to keep the vegetables from scorching. Add a little water if necessary. If the stufato seems too liquid, uncover and cook over medium-high heat for a few minutes to reduce. Check seasoning. Serve warm or at room temperature. Drizzle a little extra-virgin olive oil, chopped fresh herbs or grated Parmagiano-Reggiano cheese atop each serving, or serve over poached eggs and toasted bread. 07 Aug	This entry was published on August 7, 2009 at 4:50 am. It’s filed under food, general, Italian food, summer, vegetarian and tagged beans, olives, peppers, seasonal and local, tomato, vegetables, vegetarian, zucchini. Bookmark the permalink. Follow any comments here with the RSS feed for this post. Excuse me, now where did I put those Top Ramen noodles? Dinner……. Yum – very nice recipe! And oh, I love how celery leaves help flavor a dish. They’re like parsley, but a little…greener. Looks delicious!